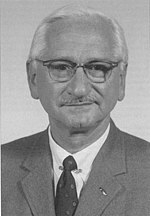 Albert Bruce Sabin (August 26, 1906 – March 3, 1993) was a Polish-born American medical researcher best known for having developed an oral polio vaccine. He received many awards and honors including the Presidential Medal of Freedom. Sabin was born Albert Saperstein on August 26, 1906 in Białystok, Russian Empire (now Poland). He was of Jewish descent. He was raised in New York City, New York and in Patterson, New Jersey. He became a naturalized citizen of the United States in 1930 and changed his last name to Sabin. Sabin studied at Patterson High School and at New York University. He was married to Sylvia Tregillus from 1935 until her death in 1966. Then he was married to Jane Warner from 1967 until they divorced in 1971. Then he was married to Heloisa Dunshee de Abranches from 1972 until his death in 1996. He had two daughters with Tregillus. Sabin died on March 3, 1993 in his home in Washington, D.C. from heart failure, aged 86. He was buried at Arlington National Cemetery in Arlington, Virginia. On March 6, 2006, the US Postal Service issued an 87¢ postage stamp carrying his image, in its Distinguished Americans series.